07/07/12 – EVILUTION presents: \\\”AniMERICAna\\\”/\\\”Red White & Bruised\\\” w/My Parasites live! EVILUTION presents: "AniMERICAna"/"Red White & Bruised" w/My Parasites live! A patriotic, SM industrial themed event. Patriotic themed burlesque acts, DJ's and more! 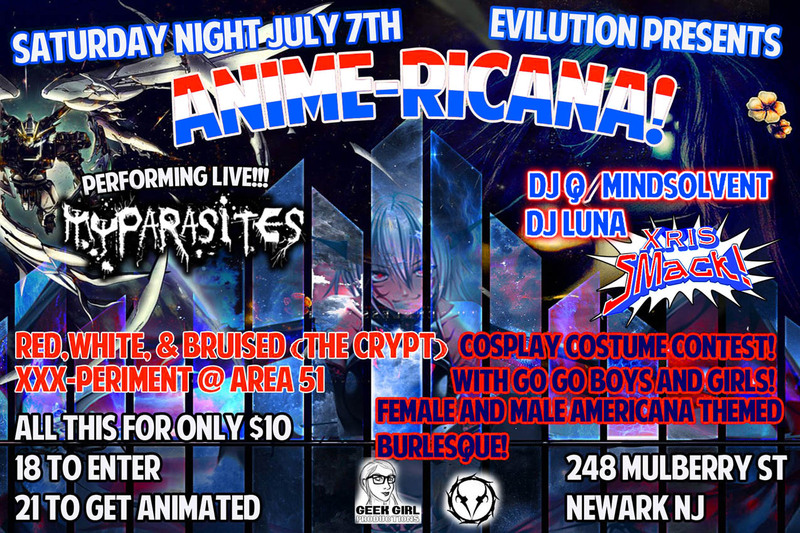 Did someone say Anime Americana Kink & COSPlay gothic industrial rave dance party event of the summer? On Saturday Night July 7th Evilution Returns with not 1, not 2 but 3 Huge parties all taking place at Qxt's and all for one low price! Only $10 18 to enter 21 to Drink! Combining elements of Industrial, screamo, and Aggro EBM, they have evolved into a mechanical blending of pure withdrawn emotion, along side a parasitic sound that is unlike any other. OH GEE SAILOR MOON performance! with 2 prizes Audience choice and Critics choices! We will experiment with new music, blend it with old favs and create a new party that'll guarantee you to move and dance all night.